A thin coat of snow covers the deck of the trapped ship MV Akademik Shokalskiy in Antarctica on Dec. 29, 2013. You probably know of famed explorer Roald Amundsen and his trek to be the first person to reach the South Pole, which he accomplished on Dec. 14, 1912. You may also know of the fateful Robert Scott expedition that sought to beat Amundsen, yet lost out by about a month and the subsequent death of Scott and his four fellows on their return journey. But you may not know of a contemporary of these two men who conducted his own gruelling exploration of Antarctica around the same time. Douglas Mawson sought to explore the huge expanse of the icy continent that lies south of Australia. His quest is a harrowing tale of survival and determination. Mawson’s often unheralded journey is the subject of Lennard Bickel’s This Accursed Land (1997). It is literally the polar opposite of what others may consider summer reading, but it’s a volume I’ve gone back to again and again over the years. This book first entered my life when my grandmother was reading it some 30 or so years ago, back home in Melbourne, Australia. Her frank assessment at the time was that the depictions of the brutally cold conditions made her want to go to the bathroom more often. I read it myself soon after, and while I can’t say it had the same physical effect on me, I was deeply captivated by the book. Mawson was already an experienced explorer by the time he formed his own expedition to Antarctica. On a previous expedition led by another legend of Antarctic exploration, Ernest Shackleton, Mawson had been on a three-man team that sought to find the South Magnetic Pole. It was on this journey he became captivated by the place and the potential wealth it contained. Mawson was a geologist as well as an explorer and had visions of the riches beneath the snow and ice that could be exploited in the future. The scientific and mapping observations made by Mawson and his team were extensive, with Bickel noting he added more territory to the maps of the world’s sixth continent than any other person of the time. 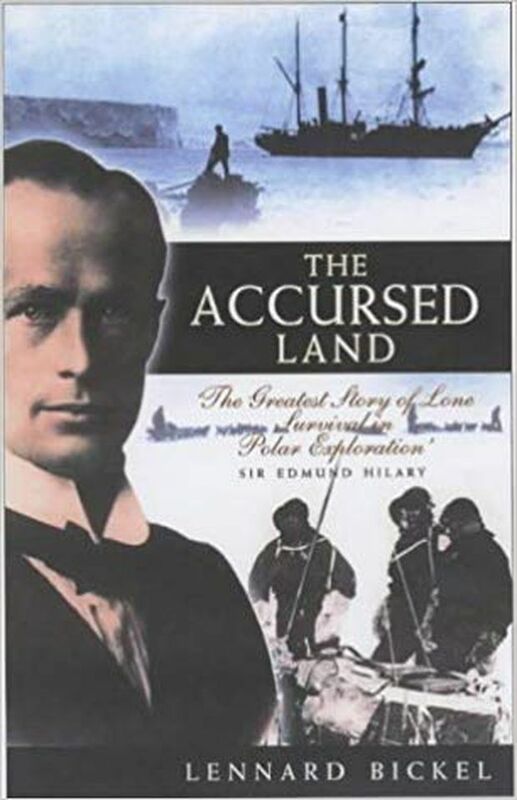 Accursed Land then follows Mawson’s efforts to fund and recruit his expedition, before skimming over the history of Antarctic exploration and settling down to the core of the story. On Nov. 10, 1912, Mawson and two compatriots, Xavier Mertz and Belgrave Ninnis, head off into the bitter cold with sleds and dog teams. The expedition suffered a major blow when Ninnis fell down a crevasse, taking his sled and a team of dogs down to their doom as well. This meant the men’s stockpile of food was gone, including food for the remaining dogs, as was their primary tent. They were still five weeks and nearly 500 kilometres from base camp. Eventually, Mertz succumbed to a mix of malnutrition and exhaustion. This left Mawson to attempt the final push to base and salvation, completely alone. “In Mawson’s anxious mind hours were miles – and miles were survival,” Bickel wrote. Does Mawson survive and conquer? You could look up the answer on Wikipedia. Or you could pick up This Accursed Land for an experience colder than lake water at the cottage.